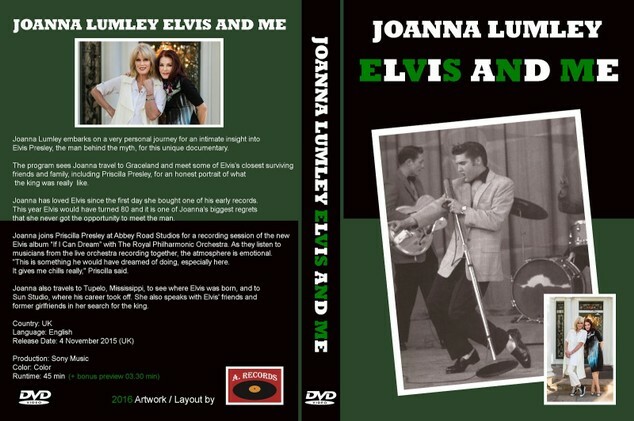 Joanna Lumley embarks on a very personal journey for an intimate insight into Elvis Presley, the man behind the myth, for this unique one-hour documentary. The programme sees Joanna travel to Graceland and meet some of Elvis’s closest surviving friends and family, including ex-wife Priscilla Presley, for an honest portrait of what ‘The King’ was really like. One of the first records Joanna ever bought was “Hound Dog” and ever since that day she has loved Elvis. This year Elvis would have turned 80 and it is one of Joanna’s biggest regrets that she never got the opportunity to meet the man. Joanna joins Priscilla Presley at Abbey Road Studios for a recording session of the new Elvis album “If I Can Dream” with the Royal Philharmonic Orchestra. As they listen to musicians from the live orchestra recording together, the atmosphere is emotional. Joanna accepts Priscilla’s invitation to Graceland for a personal tour of Elvis’s home, where Priscilla shares intimate memories about their married life and Joanna learns that Elvis was an insomniac who preferred milkshakes to alcohol. Elvis had just turned 22 and was the biggest sensation in music when he bought the house. But his story began in Tupelo, Mississippi, where he was born. Joanna heads there next, to see his humble beginnings for herself and visit the shack which Elvis’s father built for the family. Joanna reveals how his parents, who couldn’t read or write, were regarded at the bottom of the social ladder in the 1930s. Joanna visits the hardware shop where an eleven-year-old Elvis bought a child-sized guitar when his protective mother, Gladys, banned him from buying the 22-calibre rifle that he had wanted. Elvis’s first song was about a boy and his dog and he played it endlessly on his guitar. It later became a hit single in 1956 but Elvis performed it for the first time on stage at his school, ten years earlier. Joanna talks to Elvis’s childhood friend Sam Bell, who reveals what life was like for a young Elvis growing up in a city blighted by segregation. She learns that Gospel was a major influence on Elvis, which would later shine through his music with the birth of rock n roll. After moving to Memphis, Tennessee in 1947, Elvis found inspiration in the capital city of the blues. One of the highlights of Joanna’s journey is the iconic Sun Studios where Elvis recorded his first record in August 1953. Sun Studios remains exactly as it was the moment Elvis walked in. Overwhelmed, Joanna performs at the microphone whilst listening to Elvis’s breakthrough record from 1954. Joanna also meets The King’s first love, Dixie Locke, who gives a fascinating insight into how Elvis was regarded as an outsider in his youth and bullied for the way he looked. Joanna visits the clothing store where Elvis created his look in the 1950s, including his infamous blue suede shoes, and follows his meteoric rise to fame. By the 1960s Elvis was earning the equivalent of 40 million dollars a year, largely thanks to his manager Colonel Tom Parker, whose influence was at times questioned by others. Just after he found fame and brought Graceland, Elvis went into the army and off to Germany, where he found Priscilla. At that key moment, he lost his beloved mother. Priscilla explains to Joanna how she picked up the pieces of Elvis’s grief and how they became close, marrying in private, before having a baby daughter together in 1968. But Elvis returned to touring and his time on the road was damaging to his marriage. He tragically died from a heart attack just four years after his divorce. Joanna talks to Elvis’s family and lifelong friends about his death, hearing about how the singer James Brown broke down at Elvis’s casket. She is moved to hear about his funeral and inspired by the legacy he has left behind.